This is the most recent culmination of the 1995 raid on the Medici warehouse in Switzerland which uncovered objects, polaroids, and otherevidence which has resulted in a number of repatriations from museums all over the world, but particularly North American museums. 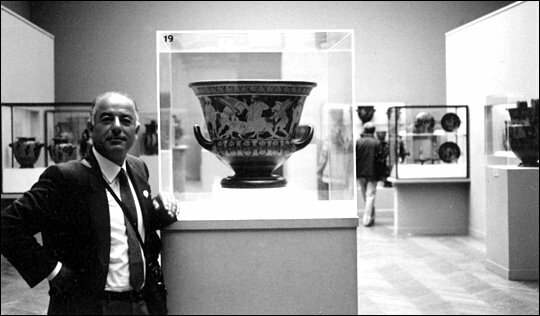 Here of course is Medici, triumphantly posed next to one of his most notorious objects, the Euphronios Krater, when it was on display at the Met in New York. This now leaves Marion True, former curator of antiquities at the Getty, whose criminal prosecution is currently ongoing. One question worth asking is, where are the other dealers, tombaroli, and museum staff? Where were those able to elude prosecution, not just in Italy, but in the United States as well. I’ll have much more on this, and Italy’s cultural policy next week in light of Francesco Rutelli’s comments at last Saturday’s ARCA conference in Amelia Italy, including his thoughts on what other objects need to be returned, why they were sent back, and his thoughts on objects which had been acquired by Robin Symes.